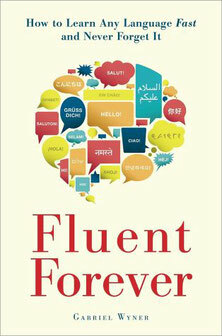 I read Fluent Forever by Gabriel Wyner and found it incredibly motivating and useful. He has compiled all manner of useful advice for learning new languages. One trick I didn’t know before was back-chaining a word. I don’t need this for Swedish, but if I were learning Czech or Polish, it would probably be a very helpful tactic. And not only is the book motivating and useful, it is also extremely entertaining to read. From mid-February to the end of April, I spent a total of 75 hours learning Swedish, which averages to about an hour a day. I started off with about 4-5 hours of YouTube videos to get a feel for the language, how it sounds and to re-learn some basic phrases. My dad (who knows seven languages, four of which he’s taught himself), advised me to learn the irregular verbs right in the beginning, so I looked them up, and wrote them all down. I don’t know every single one yet, but recognizing that ‚gick‘ is the past tense of ‚gå‘ (to go), for example, is essential if you want to be able to read. Before I started, I estimated that I would need to study Swedish for about 200 hours in order to be able to read novels. I came up with this number because at the back of Fluent Forever is an appendix with language difficulty estimates from the Foreign Service Institute and Swedish is listed as a Level 1 language, which means that FSI students need about 575-600 class hours to reach advanced levels of fluency. Since Swedish is a Germanic language and I speak English and German fluently, I figured I would need a lot less hours in order to be able to read, just because I am able to recognize so many words. i.e. a German speaker already has a rather large ‚passive vocabulary‘ in Swedish. Setting a goal of a certain number of hours, or keeping track of them is helpful because language learning is often overwhelming and frustrating just because of the sheer amount of information. Pronunciation rules, noun declensions, verb conjugations, prepositions, word order, a dictionary with some 50,000 words and phrases, not to mention all the idiosyncrasies of languages, the odd phrases and word combinations which mean something entirely different than the words themselves. (What does a beginning English language learner make of the phrase ‚you drive me nuts‘? ) So keeping track of the hours I spend is motivating for me, because in the beginning, this is the only way I can see that I’m making any kind of progress. When learning a language you are never ‚done‘. You could spend the rest of your life studying the intricacies of your native language and never be finished. After an hour or two of Swedish I know that I am ‚done‘ for the day and that if I do this (almost) every day, then I will learn Swedish, even if it often doesn’t feel like it. Actually a no-brainer, isn’t it? Sometimes I wonder if the problem hasn’t been that I didn’t know how to go about doing this, but was rather that I didn’t place learning Swedish at the top of my priority list. One nice thing about re-learning a language is that some things you think are new just “make sense” or “feel right”, and I suspect that’s when neurons in your brain are firing excitedly, yelling “hey, I know this! I’ve learned this before.” Those are the bits and pieces that are easy to learn and it is definitely easier to pick up the language again in comparison to someone who’s actually starting at square one. Again, depending on which languages you already speak or read. YouTube videos: For example, Learn Swedish with Erik was one of the better ones. Very entertaining as well.